With more than 30,000 miles of rivers and streams winding through the state, it’s no secret that fresh water is abundant in Maine. The vast western region called the Lakes and Mountains claims a fair share of these waterways, with endless falls and swimming holes that invite lazy afternoons by the river. Imagine a little bit of everything—cascades with spectacular drops, kid-friendly wading pools, and tiny potholes just big enough for you and a friend. Here are 12 of our favorites for swimming, hiking, and riverside picnics. 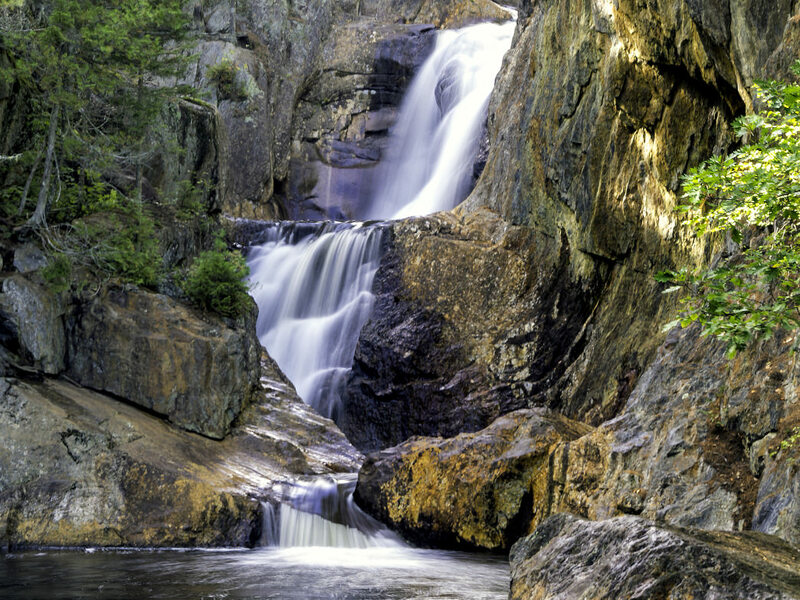 A series of waterfalls and pools makes Coos Canyon a watery playground with plenty of room to lounge and is also one of Maine’s most beloved swimming holes. Look for flecks of gold on your toes when you emerge from the water because the Swift River is full of the precious metal—there’s even gold panning equipment for rent at the shop across the street. Admire the colorful rocks at Smalls Falls as you relax in the water. Overlapping bands of rocky cliffs frame a set of short drops at Smalls Falls, which tumble into wading and swimming pools. Bathrooms and fire pits make this an easy place to while away an entire day, and the gorge itself glows with spectacularly colored rock in shades of brown, gold, orange, and black. Emerald-green water flows from the White Mountains into this beautiful pothole, where hemlock trees dip almost to the surface of the water. The snow-fed stream ensures it stays cool through the summer, so Rattlesnake Pool is a great mission for the very hottest afternoons of the year. Located along the Swift River at the base of a small waterfall, Three Pools is a local favorite on a hot day. Surrounded by forest and rocky boulders with mountain views in the distance, this is also a beautiful spot to visit in the fall when the leaves are changing—even if you aren’t going for a swim. 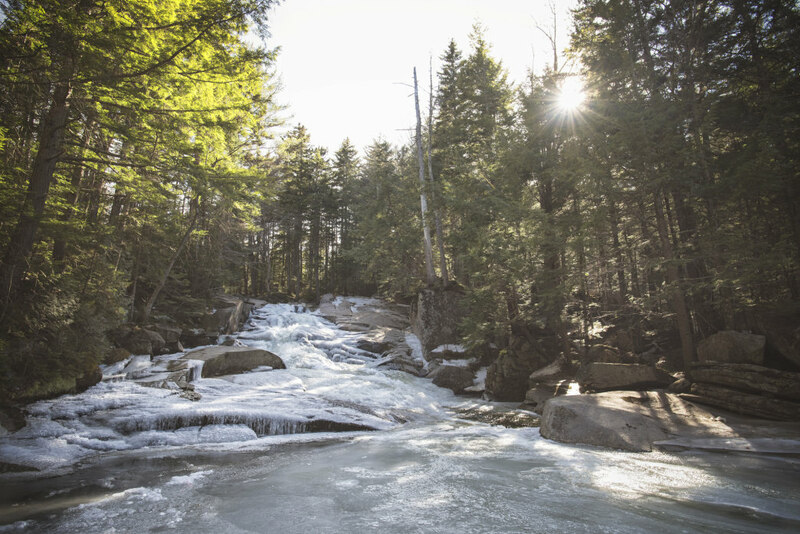 Rippling through a 24-acre preserve managed by the Mahoosuc Land Trust, Step Falls slides right into a swimming hole surrounded by granite slabs. Though the deep pools are ideal for cooling off on a summer afternoon, Step Falls is another one that is especially beautiful in autumn, when the surrounding deciduous forest sends bright reflections across the surface of the water. Find a quiet pool to swim in at the Cataracts. Dropping 60 feet over mossy rocks in Frye Brook, you have to put in a bit of effort to get to The Cataracts. A short-but-steep hike into the woods will take you to a cluster of swimming holes and waterfalls. There’s a quiet pool for swimming in, but lots to explore in the surrounding forest: climb over the rocks, follow trail extensions to hidden spots, and search for abundant wildflowers in the spring and early summer. Follow a portion of the Appalachian Trail to reach Dunn Falls, a pair of waterfalls on the West Branch of Ellis River. The upper falls streams over low-angle rock, but the lower falls drop steeply into a pool, framed by high rock walls on either side. There’s no swimming at the falls but keep on eye on the river as you make the mile-long hike in and you’ll find appealing spots to soak. There are plenty of wading pools at Screw Auger Falls. Autumn foliage makes a brilliant backdrop for Screw Auger Falls, a popular spot on scenic Bear River that once powered a sawmill. The wading pools here are ideal for cooling off, and a series of potholes pockmark the inside of the gorge. Look for the small natural arch or keyhole alongside the falls, and don’t miss the roadside Puzzle Mountain Bakery, a wooden stand selling self-serve pies, whoopie pies, and maple cream cookies. 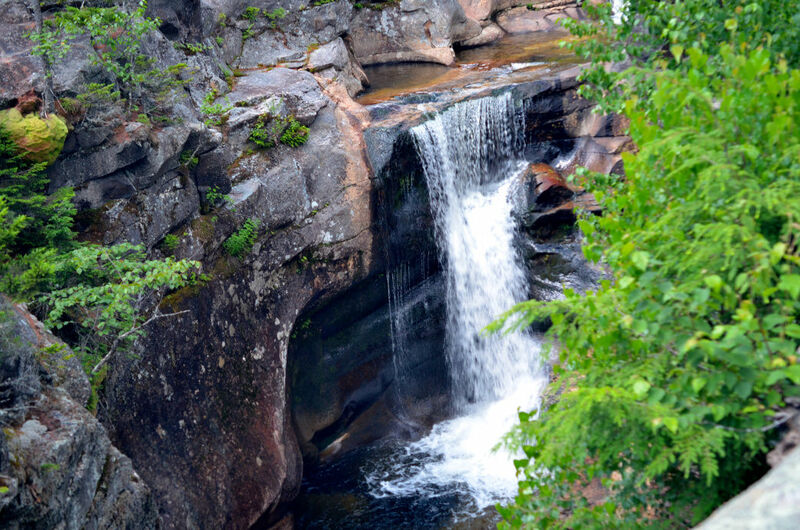 You’ll find the longest single drop in Maine at the 90-foot Angel Falls at the end of a .8-mile trail near the Rangeley Lakes. (On sunny days you might also catch a few rainbows in the frothy mist!) There’s nowhere to swim here, but the hike alone is worth the trip, with adventurous rock scrambling and brook crossings. Located a short distance from Maine Huts & Trails Poplar Hut, hikers will find Poplar Stream Falls at the edge of Warren’s Trail, a mostly-flat stroll (or bike ride) from the Airport Trailhead. There’s a broad poll at the base of the falls that’s ideal for a swim, and you can make a weekend of it if you’re bedding down at the nearby hut. Take a short, 5-minute walk to the two-tiered Huston Brook Falls. It’s not far from the small town of Kingfield, and has a deep, cold pool that will hit the spot on a hot summer day. There is a small, rocky beach next to the swimming hole and kids love exploring the area. For even more ideas of things to do on your next trip to Maine, click here. Written by Jen Rose Smith for RootsRated in partnership with Maine’s Lakes and Mountains Tourism Council.